We are proud of what we have done years ago. We are proud that we Filipinos had shown the world we can unite and cause change. Are all Filipinos involved in the EDSA Revolution or only a mere handful of those in Metro Manila? Maybe nakiki-isa in spirit yung mga taga Visayas at Mindanao. Who knows. 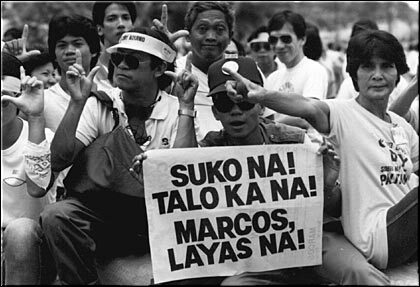 Nothing against the "heroes" of the nation who rallied in EDSA to "risk their lives" for Democracy. It was indeed a display of People Power. Could be someone you know was there. Maybe you can ask how things has changed. Someone showed this video that I am sharing on this article. And I believe this earns a spot on this blog because it does show a different perspective and it plays a very big part of the Filipino culture. Please finish the video, it has interesting content.